Since Holm House in its previous guise as a rather expensive boutique hotel, with an understated, underpromoted (but overpriced!) restaurant closed a couple of years ago there have been numerous rumours of new owners, reopenings, conversions to a private home and lots more besides. But last month, Holm House reopened under new ownership as a shiny new hotel, restaurant, bar, tea garden and spa – still offering something special, but targeted with far more mass appeal than its previous incarnation. This was of particular interest to me and Mr W, given we live about 100 yards from the place, so it has potential to become a very nice new local for us! After popping in for a drink at the (lovely) bar shortly after it opened, we decided to book a table for Sunday lunch to go along and try the new menu. The dining room is lovely – light and airy with views across the hotel’s garden, and out across the Bristol channel. Light wood, turquoise and pale silver fabrics give it a lovely tranquil feel. Diners can have a pre-dinner drink in the snug bar, the cocktail bar or the lounge area and it’s definitely a very relaxed place to spend a Sunday. 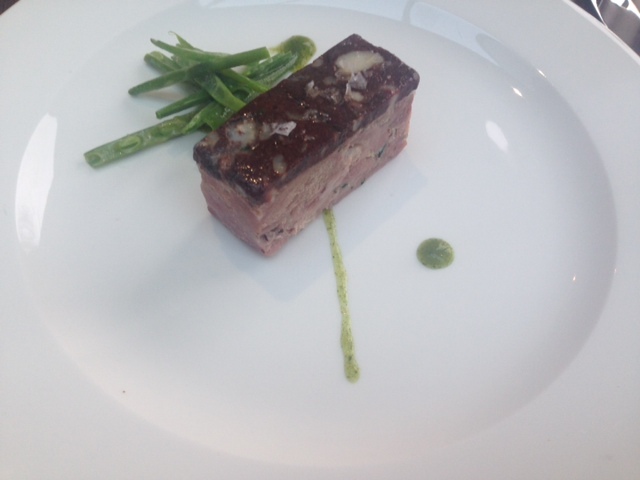 A three course Sunday lunch menu was on offer for £22.95, and I started with a ham hock terrine. The terrine was topped with a fine layer of black pudding, which I really enjoyed, but could have done with being mentioned on the menu as black pudding is not everyone’s favourite! 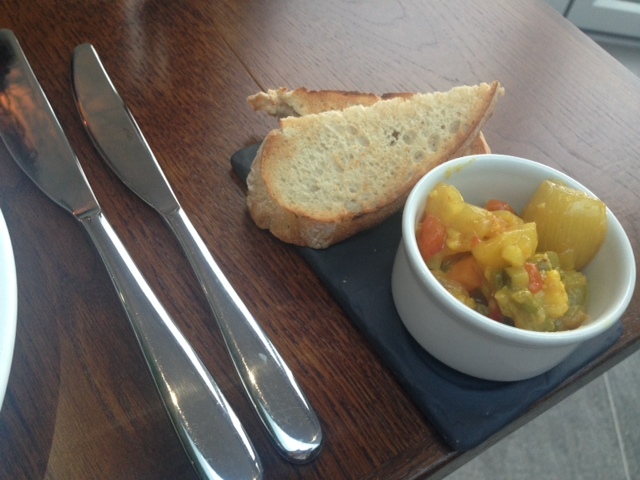 It was served with toasted sourdough (lovely) and piccalilli, which was nice and chunky but lacked a sharp bite of mustard or vinegar. 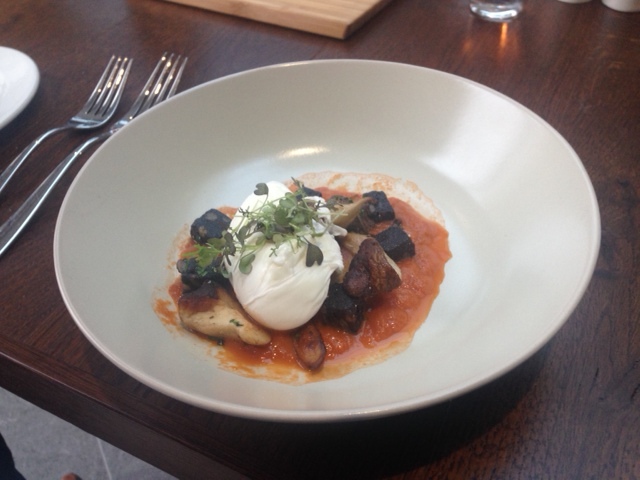 Mr W’s starter was a soft poached egg, served with black pudding, ceps and ‘ketchup’. This was an excellent dish – the egg was cooked just right and the flavours were excellent, especially the ketchup, which had a nice bite to it. 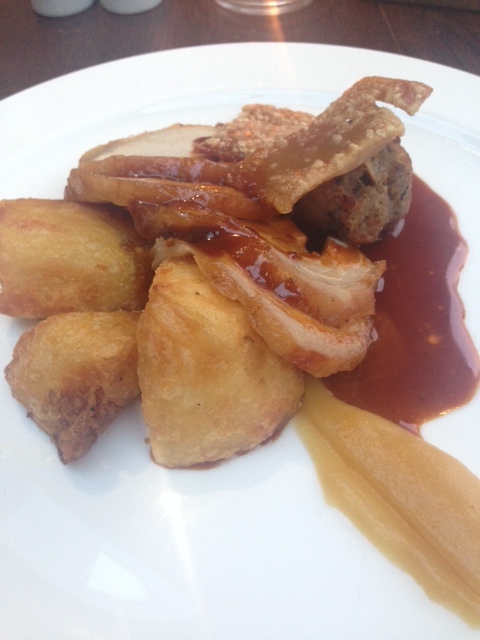 We were both in the mood for a roast (a fish and risotto dish were also on offer) so we opted for pork with crackling, toffee apple puree and sage and onion stuffing (me) and beef with Yorkshire pudding (Mr W). 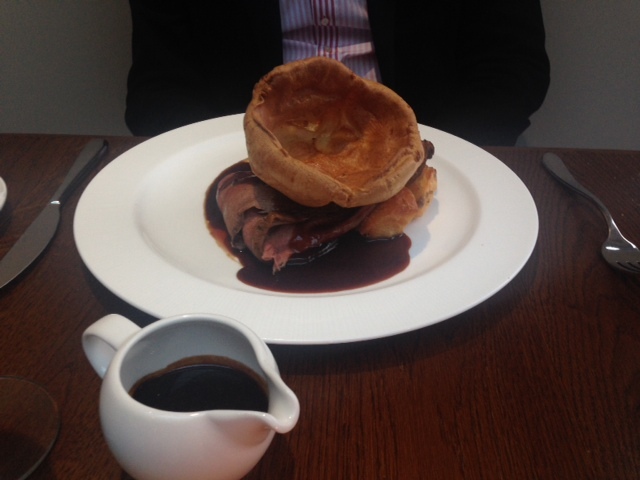 The manager very kindly offered me a Yorkshire pudding too – I wasn’t going to turn that down! Our meat was cooked very well, and the roast potatoes that the roast came with were absolutely excellent – some of the best I’ve had that aren’t home cooked. 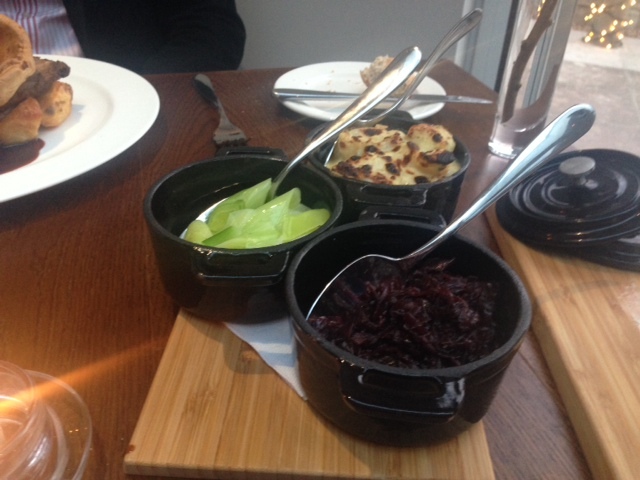 I was thrilled with the vegetable selection as it was three of my favourites: cauliflower cheese, spiced red cabbage and buttered leeks. These all went down exceptionally well with me but may not have appealed to the traditionalist roast dinner eaters out there who may have preferred a more conventional selection of root veg and greens! They were all cooked really well, though. I loved the toffee apple puree with my pork, and Mr W was impressed by the strength of the horseradish that came with his beef (he’s not keen on weak horseradish!) Our only slight negative about the roasts was that the gravies (we had one each – pork and beef respectively) both had an extremely strong flavour to them which suggested a bit too much gravy browning had been added! I don’t even know if it had been made with gravy browning, but that’s what it tasted like. 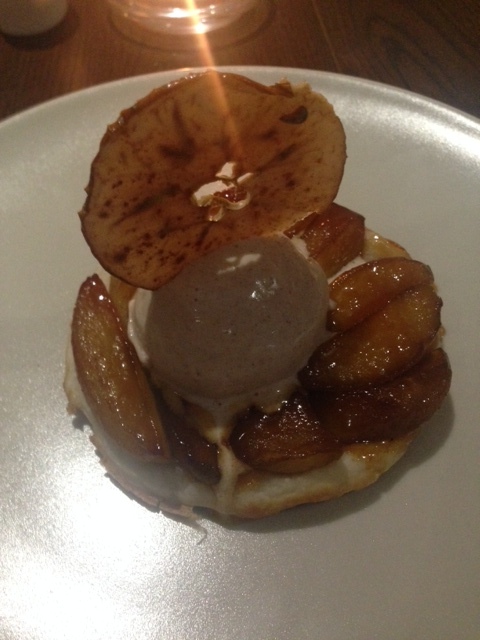 To finish, I chose an apple tarte tatin. I was a bit disappointed when it arrived as it wasn’t a proper tarte tatin (cooked upside down with lashings and lashings of caramel), but rather a disc of puff pastry, which was slightly undercooked in the middle, topped with some slices of very sharp apple and a bit of caramel, which wasn’t sweet enough to counteract the sharpness of the apple. Similarly, a scoop of cinnamon ice cream wasn’t very sweet and therefore didn’t really work with the dish, but was the nicest thing on the plate and was quite nice with the apple crisp served on top. I think the dish had the best of intentions, but just didn’t work, and the traditional tarte tatin recipe really shouldn’t have been messed with. 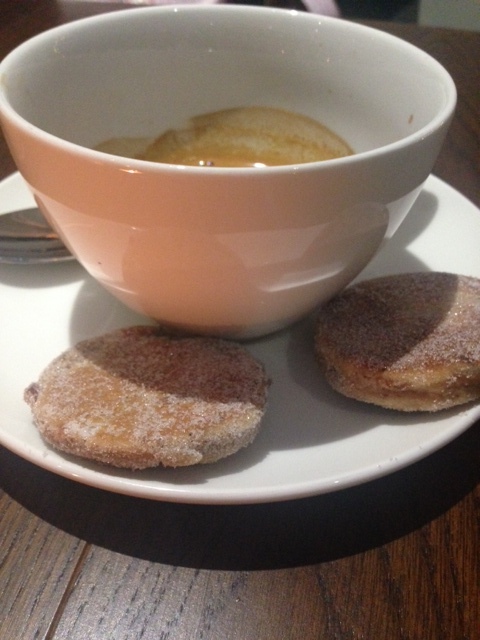 Happily, Mr W thoroughly enjoyed his coffee, especially as it came with two mini Welsh cakes on the side! We also particularly enjoyed the mojito in the bar beforehand – that comes highly recommended, although at £9, it’s not cheap! The service was excellent throughout the meal, and we were thrilled to discover that the head waiter, Juan, from the Custom House in the days when we used to enjoy it there (we haven’t been back there much since he left, and not at all since I was served a still frozen lasagne a few months ago), is now heading up the team at Holm House. Nothing was too much trouble for any of the staff and they seemed very proud of the new set up and keen to make sure we were enjoying ourselves. Despite a couple of minor flaws with the food, we really like the reincarnation of Holm House, and can see ourselves becoming regulars!